The author is grateful for the support of his wife and daughter in this research work and its presentation. From the contents of this study it will be obvious that the facilities provided by the Public Record Office of Northern Ireland (P.R.O.N.I. ), the Census Office and the Linenhall Library in Belfast have all been invaluable. The author now acknowledges the permission of the Deputy Keeper of the Records, Public Record Office of Northern Ireland to draw upon P.R.O.N.I. material. He is equally grateful for the use of data reproduced from the 1911, 1926, 1937, 1951, and 1961 General Reports, and 1971, 1981 and 1991 Summary Reports by permission of the Controller of H.M.S.O. and the Department of Finance and Personnel. Slopes near the A501 road are generally steep. On the ground between the A501, the B102 and the Glen burn medium slopes predominate but are interrupted by incised stream tracts and interspersed with low sloped patches. By contrast the area between the Glen burn, the A501 and the Al roads is dominated by low slopes. Still more variation is provided by undulating ground lying east of the Al road and south of a line joining Dunmurry Railway Station and the Giant's Ring (which may date to Neolithic times). Most of the Tertiary lava flows are composed of basaltic rocks which have proved to be attractive to building and road construction interests over the years. In the upper Glen reaches the underlying chalk of Cretaceous age and the Keuper marl of Triassic age have been worked in the recent past. Paradoxically, the Bunter Sandstone (of Triassic age), which provides the Lagan valley floor, has provided only limited amounts of building stone but yielded a highly significant source of groundwater. Boreholes sunk into the Sherwood sandstone, for example, at Dunmurry, Kilwee, Larkfield, and Derriaghy have all proved this deposit to be a useful aquifer. By contrast the Silurian grits and shales are not well exposed in this district and are best displayed in the incised tracts of right bank tributaries of the Lagan river, as for example in the Drumbo burn3. Most of the glacial sands and gravels lie in a 3¼km wide band stretching from S. Belfast to Lisburn and beyond, being flanked by glacial till deposits which thin out rapidly above 213m to the northwest. Locally sand and gravel deposits lie on both sides of the N.I.R. track, as well as on ground beside Dunmurry and Upper Dunmurry Lanes. Glacial till is fairly extensive in the Ulster Avenue and Seymour Hill localities, as well as in the Areema, Park and Green neighbourhoods. Fragments of a glacial esker are still to be seen in Dunmurry near to the railway track and McMasters bridge, as well as close to Warren House. Further east Ballydrain lake occupies a glacial kettlehole amongst the kame deposits that border the nearby Lagan and stretch towards Lisburn4. Some years ago two till deposits separated by sandy drift were exposed on the southwest slope of Rathmore hillock and it was here that an unfortunate accident claimed the life of a young boy. It is also worth noting that the subsurface disposition of rockhead contours, north of Rathmore, suggest that two former channels are now buried by superficial deposits on either side of the Malone ridge. 1. 60m contour. 2. Steep slopes (12° or more). 3. Named hills A. Black, B. Collin. 4. Water body. 5. Stream. 6. Incised valley tract. 7. Dunmurry esker. 8. Selected road. 9. Railway lines. 10. Dunmurry NIR station. 11. Former country houses of business families (a. Collin, b. Suffolk, c. Larkfield, d. Moat Park, e. Dunmurry, f. Rathmore, g. Warren, h. Seymour Hill, j. Ballydrain). 12. Church sites at Derriaghy (1), Lambeg (2), Drumbeg (3), Suffolk (4), Dunmurry N.S. (5). 13. Giant's Ring. Key to inset diagram: A. Moat Park. B. The Green. C. Areema. D. Kilwee. E. Ulster Avenue. F. Seymour Hill. G. Conway. a. Kingsway. b. Upper Dunmurry Lane. d. Glebe Road. e. Glenburn Road. The dash symbol indicates the present built-up area of Dunmurry and Seymour Hill. Alluvial deposits and fluvial terrace remnants are to be found alongside the Lagan between Lambeg, Drumbeg and Edenderry. They also occur beside the Glen burn between Suffolk and Dunmurry. Some alluvial spreads are associated with the middle stretches of the Derriaghy burn but their distribution is deemed to be unusual. The presence of glacial sands and gravels has affected local relief and soil parent material, besides offering limited supplies of groundwater or raw material for extractive industry. Sandy areas tend to provide light to medium loams whereas glacial till is often associated with heavy loam. (Poorly drained till deposits, on the other hand are apt to gley or become peaty.) Natural conditions over the years have therefore favoured the development of acidic brown earths in association with these loamy textures to produce soils of medium quality to local cultivators5. The Lagan is the major river in the area. It is deflected from its northeasterly course by the glacial deposits of the low Malone ridge before resuming its flow to the north northeast, past Edenderry. The diverse and longstanding use of its waters are well known but its increasing abuse in recent years has only recently been formally acknowledged by the Environment and Heritage Service6 of the Deptartment of the Environment. Dunmurry village was originally located on the interfluve between the Derriaghy and Glen tributaries to the Lagan. This feature of convenient proportions and easy gradients, like the interfluve between the Glen and Ladybrook burns, leads directly from Laganside to the hillfoot slopes at Suffolk. Surface waters coming off Aughrim, Collin and Black mountains feed the Derriaghy and Glen burns as they flow south eastwards to the Lagan. The Glen catchment covers c. 13 sq.km, which is slightly larger than the area drained by its neighbour. It possesses an elongated shape with its headwaters rising on peaty, rough grazing land above 300m. A well incised middle stretch of this stream, between 210m and 50m, gives way to a gentle, sinuous course between Suffolk and Dunmurry where an incised tract reappears7. The Derriaghy catchment possesses a different form, in which many small tributaries rise below 245m and join to produce an asymmetrical drainage pattern. Between 245m and 60m these small, youthful streams flow in near parallel courses that also possess short incised stretches. Below 60m, however, both trunk and tributary streams follow distorted alignments before joining up to flow past Seymour Hill in an incised tract. While the general nature of the Glen and Derriaghy discharges is similar, because of close proximity, their natural flows have been unavoidably modified by human activities over the last 200 years. Increased demands for water and the control of surface discharges from textile interests have resulted in a legacy of weirs and mill races, as well as scattered remains of water power installations in the district. Increased suburbanisation and changing land use in both catchments over the last 50 years have next promoted flashiness in rates of runoff and increased risks of pollution from both domestic and commercial sources8. An annual rainfall of 1040mm to 1578mm can be anticipated in these two catchments, depending upon elevation, with about two thirds of the total falling between September and January. Snowfall and severe frosts are usually shortlived between December and March. Surface temperatures for much of the year are mild over the low ground, with highest values coming between May and August in a growing season of 250 to 260 days. Physical conditions have therefore promoted daily runoff rates in the local streams that can fluctuate widely between September and January. High average flow rates are usual between November and January, to be followed by declining discharge rates during February and March. After a brief springtime flurry the longest period of low discharges then occur, between June and September. Environmental factors have certainly been favourable for the growth of both deciduous and coniferous trees on the low ground about Dunmurry. Today, however, it is obvious that what was formerly part of Drumbeg parish is well treed, as a parkland legacy from past landowners. Westwards, however, fields that were once cultivated in the former Shankhill portion of Dunmurry townland have now either been built over or put down to grass, in hedged fields. Historical records of one form or another confirm that the evolution of the vegetation cover, since deglaciation, has been subject to repeated interferences. Palynological and dendrochronological records indicate that severe climatological changes have influenced the local vegetation in post Pleistocene times. About 6000 years ago, for example, the climate was warmer whereas about 1000 years ago it was cooler than at present. Recent research by Baillie9 has now drawn attention to the dateable climatic effects of "dust veils" from volcanic sources, as well as the possible influences of sudden and marked changes of past human activities on regional plant covers. Natural conditions in this district have proved to be amenable to subsistence and then commercial agriculture involving crops and livestock over the last 5000 years. The ephemeral use of timber and the more lasting use of rock and water resources have also been promoted and sustained from local sources. In more recent times, however, a generally harmonious and measured use of land resources below 100m has become increasingly disrupted by the encroachments of industrial installations and the suburbanized lifestyle, in this part of the Lagan valley. As we now know air quality over Dunmurry and Kilmakee townlands has become highly susceptible to adversity, because of a combination of distinctive relief and microclimatic factors to which an overload of man made pollutants is being added incessantly. Regional Geology of N. Ireland, Wilson H.E., HMSO, Belfast 1972. The Palaeozoic era is a geological time unit subdivided into six geological periods. It began some 505 million years ago and was succeeded by the Mesozoic era. This unit began about 225 million years ago and it contained the Triassic, Jurassic and Cretaceous periods. The next Cenozoic or Tertiary era began 60-70 million years ago. The onset of cold Quaternary conditions began about 2 million years ago and was followed by Recent or Holocene conditions only 20,000 years ago. Geology of Belfast and the Lagan valley, Manning P. et al., H.M.S.O., Belfast, 1970. Les Montagnes de l'Irlande Septentrionale, Raffey A., Imprimerie Allier, Grenoble, 1972. N. Ireland Environment and Natural Resources, Cruikshank J. and Wilcock D. (edits. ), Q.U.B. and N.U.U., Belfast, 1982. Proposals for a Water Quality Strategy for the River Lagan catchment, Dept. of the Environment (N.I. ), Belfast, 1998. `The Glen burn at Dunmurry 1974-75', Common R., Geography Dept. Research Papers (1), 1977, Q.U.B. `The 1970 Glen burn floods', Common R., Irish Geography 6, 1971, p. 302. A Slice through Time, Baillie M.G., Batsford, London, 1995 (especially Chapters 5-8). This is possibly the former watchman's shelter on the bleaching green established here in the 18th Century. Glacial conditions ended locally about 12,000 years ago and with the onset of favourable climatic conditions both plants and animals colonised this area. There was then time and opportunity for these incomers to adjust to each other and to physical conditions before the first people arrived and left us tangible reminders of their former presence. Field evidence collected at Greenoge10, on Dunmurry Lane, included worked flints, pottery fragments and hearth ash to suggest that this site had been occupied by residents in Neolithic times, i.e. c 3000 BC. Worked flints were later discovered on cultivated land about lkm away to the south, indicating that these early settlers had also been in this locality11. Other signs of early occupance have been found 2'/2 km. away to the southwest near River Road, in Kilmakee townland, and these artefacts have been interpreted as late Bronze Age relics, i.e. 1500 BC — 500 BC. Our earliest known residents came at a time when the Mesolithic hunting/ gathering economy was giving way to more settled activities based upon livestock and crops. This new lifestyle fostered innovations with pottery, cultivation of barley, domestication of animals and piecemeal tree clearances — to improve both the quality and life expectation of these early farmers. Bardon''- has already observed that some of these Neolithic people produced pottery distinctive enough to be recognized by its so-called "Dunmurry style". Other tangible evidence of cultural development in this period is provided nearby in the demarcated space of the "Giant's Ring" and its special grave site marked by a simple, stonebuilt dolmen13. Changing climatic conditions, however, were to affect adversely the tree cover of oak, elder and elm on the better ground as well as the birch and pine on the poorer soils. Both climatic and human factors were to influence the distribution of animals such as the deer, wolf and hare. Between 300 BC and 500 AD the defended, isolated farmstead was to appear and then multiply across the province. Many of their former sites are still clearly marked by the presence of raths and cashels. 1. Stream. 2. Traces of Neolithic occupance. 3. Rath site. 4. Motte or Dun site. 5. Standing stone. 6. Recorded early chapel but site uncertain. 7. Early established church site at A. Derriaghy and B. Drumbeg. 8. Ballydrain bawn site. 9. Furrowed ground. 10. Former parochial boundaries of Shankill, Derriaghy and Drumbeg by 1832. 11. Detached Shankill segments in 1832. 12. Townlands and their boundaries. The rath, as can be seen from that located near the former site of Dunmurry House, is a small, circular earthwork accompanied by one or more encircling ditches. An enclosed central area was formerly used as a living site for one or two settled families engaged in subsistence farming activities nearby. Other rath sites have been identified south of Twinbrook Dairy Farm and near the Lagan east of Drum bridge. Local tradition has Rathmore House standing upon a former rath site and Rev. N. Barr has noted that in 1837 one existing and one destroyed rath occupied ground in Killeaton while two former rath sites were known to have been located in Kilmakee townland14. From field evidence elsewhere it is known that some of these distinctive features were in use from early Christian to Norman times, i.e. 4th to 13th centuries AD. If such a continuity of occupance had occurred in the Areema rath, Dunmurry, then it could possibly have been occupied at the same time as the nearby motte. It must not be assumed that other less durable forms of habitations were absent in this district. The siting, construction and activities associated with the rath does imply that it was an indicator of social status. The motte beside the former site of Dunmurry House is a sizeable, man made mound of earth. It is a steep sided feature, circular in plan and flat topped so that a prefabricated wooden fort could be erected upon it. Like the nearby rath this feature has been subject to minor alterations in recent times. A footbridge once crossed the bounding ditch, on the southwest side, and the outlines of the mound have been trimmed. No bailey seems to have been recognized but there is an interesting near coincidence between the base diameter of this artificial mound and that of the rath nearby. At present it is assumed that this motte is associated with Anglo Norman influences and was placed, strategically, on a hillock close to a significant traverse route across the Lagan valley. Until this motte has been thoroughly investigated, however, the possible use of its site in pre Norman times cannot be discarded — nor can its restricted use to Anglo Norman times be assumed. In the Anglo Norman period the year 1306 is noteworthy because an ecclesiastical tax confirmed the presence of three well established parishes in this part of the Lagan valley. Shankhill or St. Patrick's parish to the north was important enough to provide the mother church for six dependent chapelries. Derriaghy to the west had early connections with Black Abbey in the `Ards and like Drumbeg to the east was in the deanery of Dalboyn, together with Cloncolmac. Cloncolmac church was supposedly located in Old Forge townland but while its site is unknown the name is still remembered in Dunmurry village. Folk memories of early Christian places of worship are reflected in the townland names of Killeaton and Kilmakee, as well as in the ward name of Kilwee. While nothing significant has yet been found in Killeaton burial urns were unearthed in Kilmakee in 1849. Local tradition asserts that the last burial at Kilwee occurred c 1760 and early records suggest that Kilmena chapel, in Shankill parish, was formerly located in the Kilwee area. Barr has observed that while parochial units were introduced hereabouts in Anglo Norman times their well defined boundaries date from the early years of the 17th century. On the other hand land units with longer pedigrees such as the townland date from pre Norman days and did not necessarily coincide with parish areas. Traditionally the townland was a territorial unit where land was worked with several families and its size was based upon the productivity of this land to satisfy the needs of the families involved. It reflected a subsistence rural economy which became increasingly susceptible to change locally with the growth of commercial enterprise in the 17th century. And, as indicated by O'Laverty15, some local townland names have been changed over the years so that Old Forge was formerly called Ballydolleghan, Finaghy used to be known as Ballyfinaghy and Dunmurry once was Ballidownmorry. Evans', in his turn, has drawn attention to the Anglo Normans introducing new tools, farming methods and livestock to this island. In spite of our lack of exact information his generalisation that a settled way of life would be established and persistent in their time is noteworthy. It involved open fields for grain crops and vegetables, common grazings for cattle, sheep and goats along with small, clustered dwellings. These might have been influential to this part of the Lagan valley. The fact that a village sized Belfast possessed a water driven mill by 1333 implies that the use of water power could also have been appreciated in the local area. Likewise the sustained farming activities of friars at Lambeg from medieval times would have caught the imagination of residents in nearby townlands. As related groups of people in scattered settlements, hereabouts, shared an understood system of land use on ground that came to be identified as townlands they also became subject to a social hierarchy. This is turn promoted larger units of organisation such as the clan or tribe, so that much of the Lagan valley and its people became subject to the Lordship of Clandeboye (the O'Neills) by the beginning of the 16th century. At this point it seems appropriate to turn to two items located near the Glen burn, both of which are enigmatic in terms of their dates of origin and original functions. A standing stone is located 1km north of Dunmurry motte in what is locally known as the "old barley field" while nearby to the southeast the golf course fairway possesses a rippled surface. These features lie on the north side of the burn and both occurred in well defined fields at the time of the Griffith's Survey (1862). The standing stone does not appear to be a glacial erratic, it stands in splendid isolation near to a distinctive and easy crossing point of the burn. The furrowed ground nearby lies on a south facing, moderate slope and is very suggestive of land that was formerly cultivated. "Lazy beds" of fairly recent origin do not really account for the length or disposition of these ridge and furrow features — readily seen in low angled sunlight or under a thin snow cover. Are they old plough marks or younger spade marks? Early in the 17th century the Chichester family received both status and land for services rendered. This land extended northwards along the Lagan valley from Drumbeg and Dunmurry to front the west side of Belfast lough, first to Carrickfergus and then beyond. Because of this grant the sale and the leasing of some ground in the Dunmurry district was to involve first the Earl and then the Marquis of Donegal. Land was also to be made available to the Stewart family who, in 1608, established a bawn (i.e. fortified house set within a walled enclosure) at Ballydrain17. An indenture of November 1605 between James Hamilton and Con O'Neill also embodied the transfer of land, which included the townland of Ballygrombegg (Drumbeg). At this time the Lagan valley was still timbered, in spite of past clearances. Between 1600 and 1641, however, more trees were to be rapidly removed between Lisburn and Belfast because of both domestic and commercial demands for housing and for iron smelting. Although houses were constructed with wood and brick in the early Plantation days bricks made from local clay deposits soon became the dominant material. Robinson" has asserted that both circular creaghts (composed of timber, earth or wattle) together with rectangular, thickwalled and open hearthed buildings were in use prior to the Plantation. Stone, brick and timber cagework houses came to be used by "planted" people in the lower Lagan valley in the 17th century. In so doing these residents promoted the use of thatch, windows and chimneys. In the Census of Ireland 165919 it is recorded that "Dunmurry and the Fall" contained 388 persons, 147 of whom were native Irish while the rest were "English". At this date Belfast supposedly held 366 incomers from Britain together with 223 native Irish while Lisburn was occupied by 217 incomers from Britain and 140 native Irish. (Collectively these figures accounted for about one third of the population in the Barony of Belfast.) Incomers from Britain obviously provided a significant element in the Lagan valley population at this time and many of them possessed cultural backgrounds or life styles which, after 1660, encouraged them to reside at or near a developing market centre. Flax seed is known to have been imported for use in the Lisburn area by Sir G. Rawdon in 1667. It would also seem that cattle and sheep rearing as well as the cultivation of wheat, barley, oats, rye and flax were all well established locally before the potato was introduced. No doubt a growing export trade in cattle, oats, hides, timber and yarn from Belfast would influence activities in its Lagan valley hinterland in the late 17th century and stimulate the care and maintenance of highways there, by landowners and labourers in defined parishes20. Army needs and other public charges. The Poll Money Ordinance of 1660 deemed Dunmurry to be worthy of attention and by 1669 the Hearth Money Roll listed 67 names for "Dunmurry liberty". Traditionally in Scotland, during the 16th and 17th centuries, the "liberty" was an area associated with a Burgh or Barony, or a Royal Burgh, in which burghesses might carry on a retail trade. 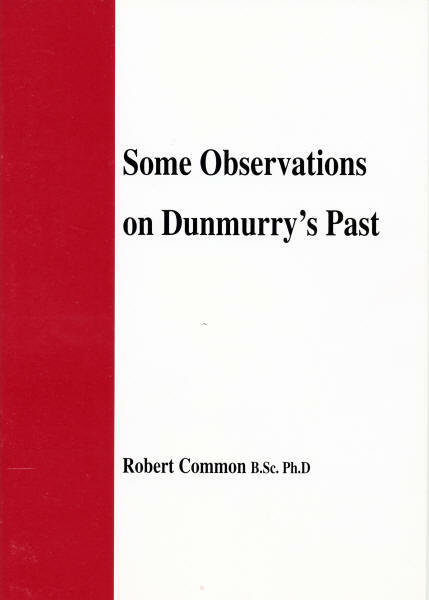 From these particular records it therefore seems likely that population in Dunmurry townland grew and shared some of the changes taking place in the 17th century, in spite of uncertainties such as the 1641 rebellion and variations in demand for primary products from the land. Both dispersed and clustered settlement possibly occurred across the low ground locally and limited land enclosure could also be present. One well defined road from Belfast probably passed Ballydrain and Drumbeg to Lambeg and Lisburn. Another hillfoot route between Belfast and Lisburn by way of Derriaghy probably provided an early alternative22. Cross valley routes by way of Dunmurry Lane and Stockman's Lane were no doubt soon established to avoid the wet land of the Bog meadow and the undulatory ground of Laganside between Belfast and Drumbeg. Early in the 18th century water power began to be applied to linen bleaching and finishing processes, with significant consequences for the local area. The possible use of water in the Lagan for transporting goods promoted further innovation and the development of commercial trade by water began in 1763 between Belfast and Lisburn. (Landing stages on this waterway were subsequently erected at Seymour Hill and Dunmurry for the discharge of coal to be used locally.) The felt needs of commercial interests for better overland transportation also resulted in turnpike trustees being appointed in 1733 for the route from Belfast to Banbridge. (But as Lendrick's 1780 map demonstrates a possible direct route from Belfast to Lisburn by way of Balmoral, Finaghy and Dunmurry was not to be realized until the 19th century.) Turnpikes were supposed to facilitate the movement of goods and people between urban centres, but they soon aroused antagonisms because of the tolls to be paid by users and the vested interests they chiefly served. Social as well as economic factors therefore have to be borne in mind when assessing the role of turnpikes in the rural areas through which they passed. Property agreements made in this century indicate that the milling of locally grown cereals and the bleaching of linen had tended to become part of farming activities. Farms near Glenburn House, for example, are recorded in 1757 as growing wheat, barley, oats, potatoes and flax and grazing cattle. One particular farm also had wooden pipes installed for water to be used at a bleach mill. It is uncertain, however, if problems of trade, land and money for farmers on Donegal land stimulated some of them to emigrate in the 1770-80 decade, as happened elsewhere. On the other hand the fear of French invasion in the 1780-90 decade did produce the Lambeg and Dunmurry Volunteers as elements in the 6th Ulster Regiment. Unsettled conditions returned in the following decade so that March 1797 is remembered as the time when property in Lambeg, Derriaghy and Dunmurry was searched by the military for weapons. An indenture of May 1794 between the Marquis of Donegal and Wm. 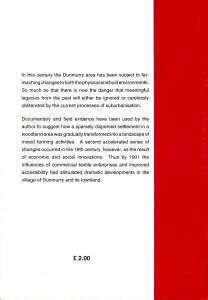 Darby* involving 22 acres of Dunmurry townland is next worthy of comment. Amongst the terms there is mention of both rundale and additional rent of £1 per acre to be paid for land given to grain cultivation. Rundale refers to a long established rural tradition in the province (and Scotland) involving cooperative group activities on open farmland and living in small clustered settlements (clachans) that house the families involved. McCourt23 has written at some length on the place of the rath, clachan and isolated farmstead in the Irish rural landscape and the significance of the words "bally" and "ton" in rural place names. 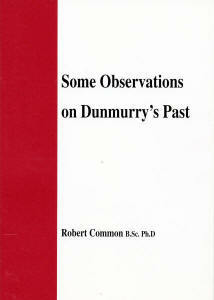 His observations now have added relevance to the past Dunmurry scene because of those 1794 terms. Church records again provide additional information about population numbers. The Parliamentary Religious return for 1775 listed 116 persons in the Dunmurry part of Drumbeg parish. Furthermore a petition of Protestant Dissenters from the Dunmurry members of Drumbeg parish was presented in 1775 and it is noteworthy that many of the 115 names it contained were of Scottish origin. Well remembered family names such as Stouppe, Stewart, McCance, Hunter, Eager, McMaster, Johnston, Moat, Graham, Morrow, Magee, Chambers and Campbell were included. The Dunmurry congregation of the Presbyterian church24 came into being in 1676 and first met in a building near the site of the church built in 1779. An official investigation in 1807 noted that this congregation involved 204 families — half of which were neither seat holders nor attenders! After early associations with Lambeg and Derriaghy it would seem that Roman Catholics first used a stable for the celebration of Mass and then a school house built at Hannahstown in 1792. Like the Anglicans, a proper place of worship in Dunmurry for the Roman Catholics was not established until the 20th century. By the latter part of the 18th century optimistic perceptions about this district and its resources, together with technical innovations in industry and commerce25 were to draw new families with business acumen and social aspirations towards this townland. These people joined or replaced families like the Hunters and McCances in acquiring demesnes of varying extent where they were to live in sizeable houses. Here they established waterside installations and bleach fields. In so doing they were to hasten the eclipse of a small scale cottage industry, dependent upon locally grown flax. This trend, once established, had catalytic effects on developments in the following century including local industry, the spread of hedged and enclosed farmland, commercial enterprise, population numbers and changes to settlement patterns. 'A prehistoric hearth at Greenoge, Dunmurry', Whelan C.B., Irish Nat. Journal 2, 1928, p. 34. 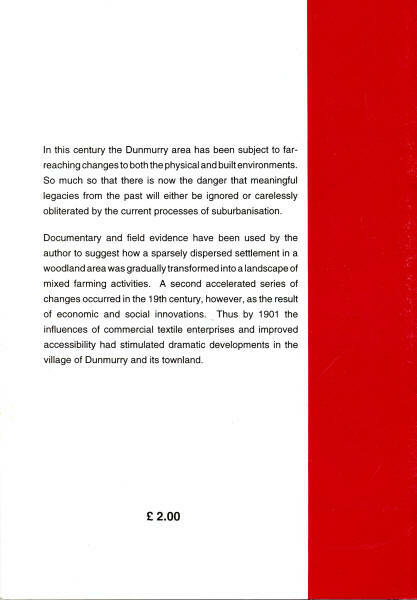 'A prehistoric occupation in Dunmurry', Sloan C., Lisburn Hist. Soc. Journal 2, 1979. A History of Ulster, Bardon J., Blackstaff Press, Belfast, 1992. Historic Monuments of Northern Ireland, Dept. of the Environment (N.I. ), Belfast, 1983. Derriaghy – A short history of the parish, Barr N., Graham and Heslip, Belfast, 1974. An historical account of the Diocese of Down and Connor, Vol II, Gill, Dublin, 1880. 'Prehistoric and Historic Background', Evans E.E., in Land Use in Northern Ireland, edit. Symons L., Univ. of London, London, 1963. Ecclesia de Drum, Neill M., Univ. Press, Belfast, 1995. 'Vernacular Housing in Ulster in the 17th Century', Robinson P., Ulster Folklife 25, 1979, p.1. The Plantation of Ulster, Robinson P., Ulster Historical Foundation, Belfast, 1994 edition. An Atlas of Irish History, Edwards R.D., Routledge, London, 1991, 2nd edition. A Census of Ireland c 1659, Pender S., Stationery Office, Dublin, 1939. 'The small towns of Ulster 1600-1700', Gillespie R., Ulster Folklife 36, 1990, p. 23. The town in Ulster, Camblin G. W., Mullan, Belfast, 1951. Lendrick's map of Co. Antrim 1780 can be inspected in the Linenhall Library, Belfast – with the well established roads in the Lagan valley depicted. 'The dynamic quality of Irish rural settlement', McCourt D., in Man and his Habitat, edit Buchanan, Jones and McCourt, Routledge and Kegan Paul, London, 1971, p. 126. A history of congregations in the Presbyterian Church of Ireland 1610-1982, Presbyterian Hist. Soc. of Ireland, Belfast, 1982. The Industrial Archaeology of Northern Ireland, McCutcheon A., H.M.S.O., Belfast, 1980. By 1780 bleach greens were in use near Glenburn House, at Seymour Hill, Derriaghy House, Suffolk House and at Lambeg.